Background: The circadian clock for patchoulol synthase (PTS) gene in Pogostemon cablin remains largely unexplored. Objective: The objective of this study is to clone and to investigate the expression of PTS gene from the leaves of P. cablin throughout a day. Materials and Methods: The full-length PTS cDNA was isolated by a combination of reverse transcription polymerase chain reaction (RT-PCR) and rapid amplification of cDNA ends in P. cablin. Gene expression profiles across leaves at different time points of P. cablin were evaluated using quantitative RT-PCR. Results: The PTS clone contained a 1659-bp open reading frame coding for 552 amino acids, a 61-bp 5′-untranslated end, and a 219-bp 3′-untranslated sequence. The deduced amino acid sequence was 47%–63% identical with the sequence of other known sesquiterpene cyclases from angiosperms. It was observed that the oscillations of PTS transcript persisted in P. cablin during the daily cycle, with peak expression occurring at 1:00 h, 5:00 h, 7:00 h, 9:00 h, 16:00 h, 19:00 h and 22:00 h. In general, PTS had lower oscillation frequency and transcription abundance at daytime than at night, corresponding with the higher temperature, the lower humidity, and the presence of an ultraviolet index. Conclusion: The PTS gene identified in this study is under clock control, which in turn may provide insight into evolutionary progresses in the green lineage. Abbreviations used: PTS: Patchoulol synthase; EC: Evening complex; FDP: Farnesyl diphosphate; RACE: Rapid amplification of cDNA ends; CMA: China Meteorological Administration. 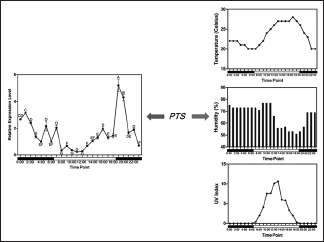 It was observed that the oscillations of PTS transcript persisted in P. cablin during the daily cycle, with peak expression occurring at 1:00 h, 5:00 h, 7:00 h, 9:00 h, 16:00 h, 19:00 h, and 22:00 h. In general, PTS had lower oscillation frequency and transcription abundance at daytime than at night, corresponding with the higher temperature, the lower humidity, and the presence of ultraviolet index. Plant sesquiterpenes are secondary metabolites with plenty of structural diversity, which show a range of biological activities, playing significant roles in plant growth and survival. In plants, sesquiterpenes of different structural types are biosynthesized by sesquiterpene synthases (cyclases), the putative key enzyme of sesquiterpenes. With the high-speed development of molecular biology and analytical chemical technologies, a number of cDNA clones encoding sesquiterpene synthases are isolated.,,, These enzymes may share a common catalytic mechanism and expression pattern with highly conserved regions. The metabolism and physiology of plants adapt to 24 h light-dark cycles, which in turn are controlled by evolutionarily conserved intrinsic circadian oscillators. Plants rely on the endogenous timekeeper to control energy production and energy consumption, activity of pollinators, as well as seasonal changes that tell them when to flower or shed their leaves. The core clockwork consists of negative feedback loops through which a series of clock components sustain their own rhythm. To begin with, cryptochrome, a light-absorbing molecule, helps light to set the daily clocks of plants. In the model plant Arabidopsis thaliana, the Myb-type transcription factors late elongated hypocotyl (LHY) and circadian clock-associated 1 (CCA1) activate the expression of pseudo-response regulators (PRRs). This activation occurs indirectly through the inhibition of the evening complex (EC), which is the repressor of PRRs. In turn, the EC indirectly activates CCA1 and LHY by directly inhibiting the repressive PRRs. Homologs to these clock genes were identified in many species.,, Circadian clocks affect gene expression in diverse organisms, and numerous plant species have been observed to exhibit diurnal rhythm including Actinidia chinensis, A. thaliana, Populus trichocarpa, and Chrysanthemum morifolium. One of the important traditional medical materials, Pogostemon cablin (Blanco) Benth. (patchouli), is a perennial aromatic herb in the Lamiaceae family, which is used to treat colds, diarrhea, vomiting, and nausea. Morphologically, patchouli adapts to hot and humid climatic conditions. Research into the phytochemical constituents and pharmacological activities of patchouli shows that oil accumulated by P. cablin possesses antioxidant, anti-inflammatory, antithrombotic, antidepressant, analgesic, and many other activities. Patchouli oil is unique because it consists of diverse sesquiterpenes, rather than a blend of different mono-, sesqui-and di-terpene compounds. Patchoulol synthase (PTS) is a putative key enzyme of sesquiterpenoid biosynthesis in patchouli, catalyzing the conversion of farnesyl diphosphate to patchoulol as the major product, producing at least 13 additional sesquiterpenes. Recently, Yu et al. confirmed that micro RNA156 (miR156)-targeted SQUAMOSA promoter binding protein-like factors upregulated PTS expression and sesquiterpene accumulation in patchouli. Circadian clocks occur with a periodicity of approximately 24 h and regulate a wide range of metabolic and physiologic functions.,, Since a substantial portion of the plant transcriptome is under clock control, we ask whether PTS involves the conservation of clock-controlled transcriptional programs? And if so, whether ambient temperature, humidity, or ultraviolet (UV) index also coordinately regulate it? The present study was undertaken to clone and investigate the regulation of diurnal variations for PTS in patchouli leaves. We have assessed the relationship between PTS expression and temperature, humidity, and UV index. Moreover, the significant changes in transcript of PTS gene throughout a day were determined. P. cablin plants were grown in pots filled with soil under natural photoperiod in Jinan University, Guangzhou City, Guangdong Province, China, and identified by Dr. Ying Zhang (College of Pharmacy, Jinan University). A voucher specimen (GHX 201711001) was deposited at the Research Center for Traditional Chinese Medicine of Lingnan, Jinan University. For analysis of diurnal regulation of gene expression, mature leaves (50–100 mg) of P. cablin were collected in triplicate in November 25, 2017, at hourly intervals during the 24 h cycle. Each sample was isolated and stored at − 80°C until use. For the isolation of total RNA, patchouli leaves were frozen in liquid nitrogen and ground to a fine powder using a mortar and pestle. Total RNA was extracted using TRIzol Reagent (Invitrogen, Carlsbad, CA, USA), following the manufacturer's instructions. An average of 15 μg total RNA was typically obtained from 100 mg of tissue. The quality and integrity of the RNA were evaluated by verification of the integrity of the ribosomal RNA bands after agarose gel electrophoresis. The presence of three distinct bands of 28S rRNA, 18S rRNA, and 5S rRNA in agarose gel proved the intactness of the RNA samples. The average spectrophotometric values of the isolated RNA ranged from 1.8 to 2.0 (A260/A280), indicating the high quality of RNA devoid of polyphenol, polysaccharide, and protein contamination. Total RNA (1 μg) from leaves was reverse-transcribed using HiScriptII Reverse Transcriptase (Vazyme, Nanjing, China), following the manufacturer's instructions. The specific primers PTS-F (5′-ATGGAGTTGTATGCCCAAAGT-3′) and PTS-R (5′-TTAATATGGAACAGGGTGAAG-3′) were designed based on the previously described PTS cDNA sequence (Acc No. AY508730). Conditions were worked out using the PTS-F and PTS-R to obtain the expected band of 1659-bp (30 amplification cycles of 95°C for 10 s, 61°C for 30 s, and 72°C for 2 min), which was purified and cloned into a Peasy-T5 Zero plasmid (TransGen, Beijing, China). The positive clone was used to isolate a complete cDNA by 3′ and 5′ rapid amplification of cDNA ends (RACE). 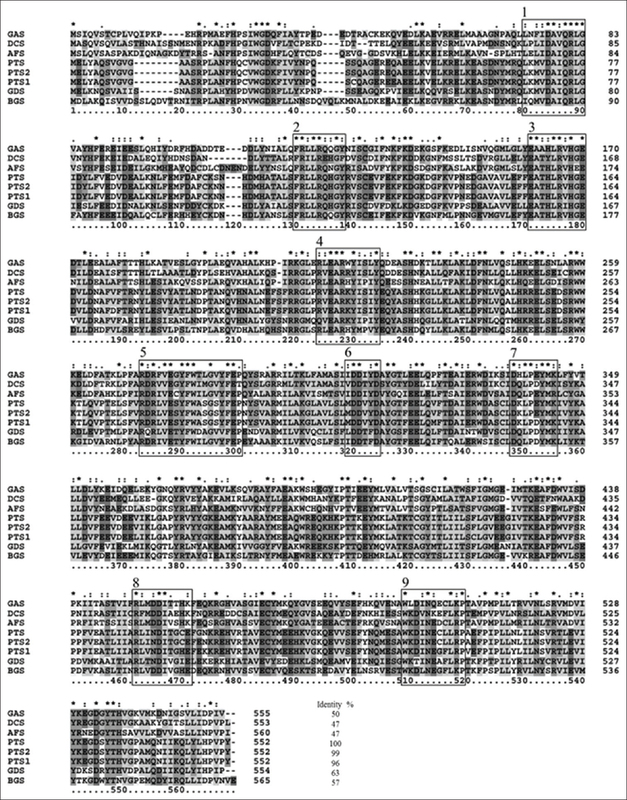 Sequence information from this clone was used to design four gene-specific primers: 5′-AAGCAGTTGTACCTTCACCCTGTTCC-3′, 5′-TGTGTTTGAGGAAGTTGACGAGG-3′ for 3′RACE, and 5′-CGAAGCCCAAAAGTAGGACTCCACC-3′, 5′-CAAGAGGACG AGAGGCAGCACC-3′ for 5′RACE. Amplification of 3′ and 5′ segments of the cDNA was performed using the SMARTer RACE 5′/3′Kit (Clontech, Mountain View, CA, USA) following the manufacturer's protocol. For complete cDNA cloning did not yield any band, even with a touch down program, nested polymerase chain reaction (PCR) was also used. Total RNA (1 μg) from each sample was reverse-transcribed using Prime Script reverse transcription (RT) reagent kit with gDNA eraser (TAKARA, Tokyo, Japan) in a reaction volume of 20 μL according to the manufacturer's instructions and diluted 2-fold before use. Relative quantitation real-time gene expression analysis of the target PTS gene and the housekeeping β-actin gene was performed (with three technical replicates) on a Light Cycler 480 (Roche, Basel, Switzerland) platform using the SYBR Premix Ex Taq II (TAKARA, Tokyo, Japan). The data were expressed as mean ± standard deviation (SD) of three biological duplicates. Analyses of the genes expression level were carried out using the 2-ΔΔCT method as described by Livak and Schmittgen. The thermal program was 30 s at 95°C and 40 cycles of 5 s at 95°C, 30 s at 60°C, followed by melting curve analysis at 95°C for 5 s and 60°C for 1 min, and then ramping at 0.11°C/s to 95°C. The amplicon for PTS consisted of 133 bp (primers were as follows: 5′-ATTCTTCGAAGCCACGCATC-3′; 5′-TGCGTTGTGGACTTG TTTCG-3′). The amplicon for the β-actin reference gene consisted of 149 bp (primers were as follows: 5′-ATTGGAGCTGAACGATTCCG-3′; 5′-AGGACAATGTTGCCGTACAG-3′). The hourly temperature, humidity, and UV index recorded at the same time points to the above gene expression analysis were provided by the China Meteorological Administration (CMA) (http://www.weather.com.cn). One-way ANOVA analysis of variance followed by Tukey's multiple comparison test was used for the comparison of means. All statistical analyses were performed using Software (GraphPad Software, CA, USA). All P < 0.05 were considered to be statistically significant. Total RNA was extracted from the freshly ground leaves of patchouli. Using the oligo-dT primers, cDNA was obtained by reverse transcription of the total RNA. Probing the library with primers designed from the sequence coding PTS (Acc No. AY508730), a 1659-bp fragment was amplified by PCR. The full-length sesquiterpene synthase cDNA was subsequently isolated by a combination of 5′ and 3′ RACE, and the sequence deposited in GenBank (Acc No. MG386648). The full-length clone contained an insert of 1939-bp with a translation starting sequence (CCGTAATGG) at positions 62–64 followed by an open reading frame of 552 amino acids. The deduced mass of the encoded protein is 64 kDa and the pI is calculated to be 5.38. PTS was not predicted to contain a plastid-targeting peptide according to the TargetP and SignalP prediction programs, which is in accordance with previous theory. Alignment revealed that there were several varying amino acids in comparison to the previously annotated PTS sequences (96%–99% identity) as detailed in [Figure 1]. In the meantime, eight sesquiterpene synthases from angiosperms including three PTS from different patchouli cultivars had been aligned [Figure 1]. The definition of the nine conserved regions, such as the most highly conserved metal ion-binding motif DDXXD (region 6), was based on a relatively limited number of amino acid sequences. The deduced amino acid sequences of PTS showed relatively high homology (47%–63% identity) to other sesquiterpene synthases from angiosperm species. The highest homology (63% identity) between PTS and P. cablin germacrene D synthase was not surprisingly observed. GAS, germacrene A synthase from Vitis vinifera (Acc No. ADR66821.1); DCS, δ-cadinene synthase isozyme A from Theobroma cacao (Acc No. EOY12645.1); AFS, α-farnesene synthase from Murraya koenigii (Acc No. AQT33225.1); PTS, PTS from this study (Acc No. MG386648); PTS2, PTS from previous study (Acc No. AHL24448.1); PTS1, PTS from other previous study (Acc No. AAS86323.1); GDS, germacrene D synthase from P. cablin (Acc No. Q49SP6.1); BGS, bicyclogermacrene synthase from Phyla dulcis (Acc No. J7 LMP2.1). Nine regions of high similarity in sesquiterpene synthases from angiosperms are boxed and labeled 1–9. “*,” fully conserved residues; “:,” chemically conserved residues. Leaves of patchouli were detached at different time points during the experiment. 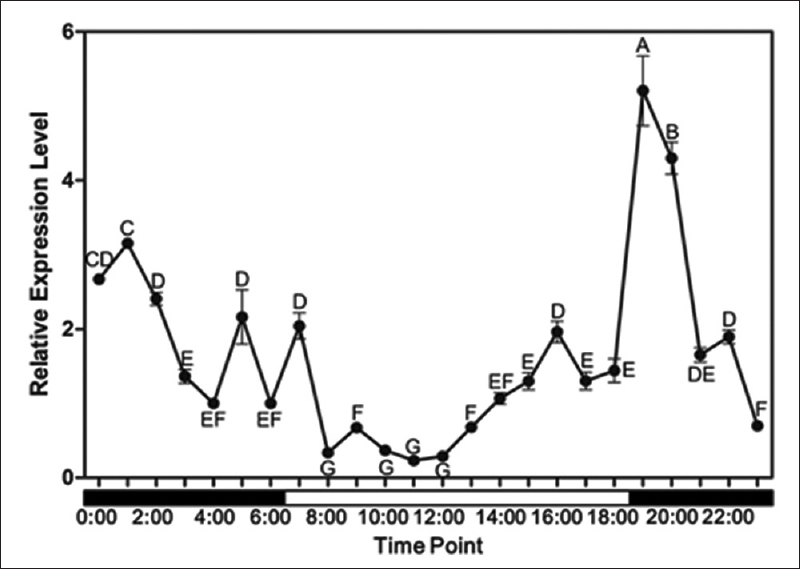 Relative quantitative real-time PCR, which was carried out over the course of a 24 h day/night cycle, revealed a PTS rhythmic expression to be present in the leaves of patchouli [Figure 2]. The transcript profile for PTS showed that peak expression levels were occurred at 1:00 h, 5:00 h, 7:00 h, 9:00 h, 16:00 h, 19:00 h and 22:00 h, with the highest expression at 19:00 h. As presented in [Figure 2], PTS had three peaks at daytime while it had four peaks in mRNA accumulation at night, thus, there was a higher oscillation frequency for PTS in the evening. In generally, night-grown patchouli accumulated more PTS mRNA than did day-grown one. Samples were collected at different time points throughout a day. The expression level of PTS at 6:00 h was used to normalize the expression level of the remaining samples. Data are presented as mean ± SD (n = 3). Means labeled with a common letter are not significantly different (P > 0.05) using one-way ANOVA followed by Tukey's multiple comparison test. The information of hourly temperature, humidity and UV index for the experiment was obtained from CMA, as seen in [Figure 3]. The temperature profiles during a day showed that peak temperature occurred at 17:00 h then declined over the next 5 h where it remained low until evening. In contrast to the temperature, time points analyses of the humidity showed that the lowest humidity was detected at 18:00 h, although levels did appear to gradually raise from evening onwards. The pattern of UV index was similar to that of temperature, with peak level occurring at 13:00 h, although there was no UV index detected at night [Figure 3]. Notably, the higher temperature, the lower humidity, and the presence of UV index corresponded to the lower oscillation frequency and transcription abundance of PTS during the daytime. Sesquiterpenes are common phytochemical constituents of many plants, and sesquiterpene synthases have been characterized in a number of plant species, including Polygonum minus, Citrus sinensis, Artemisia annua, and A. chinensis. In patchouli, PTS was assumed to be the key enzyme responsible for the synthesis of patchoulol plus at least 13 additional sesquiterpene products. Our data showed that the amino acid sequence similarity between the new PTS and other PTSs from previous study varied (96%–99% identity) as detailed in [Figure 1]. Patchouli is native to Southeast Asia and has been cultivated in China over 1000 of years, resulting in a genetic divergence between the different patchouli cultivars. In general, the PTS showed the same pattern of sequence homology to other sesquiterpene synthases [Figure 1]. The rotation of the earth on its axis confers daily changes in the environment with a wide variety of consequences for plants that have to contend with the transitions from day to night and back again. Circadian clocks that temporally organize many aspects of growth and metabolism are found in numerous plant species.,, Our work also showed that over the course of a day-night cycle, PTS expression followed an obvious diurnal rhythm with peak expression levels occurring at 1:00 h, 5:00 h, 7:00 h, 9:00 h, 16:00 h, 19:00 h and 22:00 h [Figure 2], which is in agreement with the results of previous study. In snapdragon, monoterpene synthase mRNA levels as well as corresponding monoterpene emission follow diurnal rhythms were controlled by a circadian clock. A similar daily fluctuation was found in the endogenous level of geranyl acetate and in the expression of its biosynthetic gene, alcohol acetyl transferase in rose flowers. In our study, PTS gene that proved to be circadian regulated seemed to have higher oscillation frequency and transcription abundance at night [Figure 2]. There could be a range of reasons that regulate the level of PTS transcript in P. cablin throughout a day, depending on a number of factors, such as temperature, humidity, light, and many other slightly controlled aspects. Our data showed that PTS transcript continued to progressively accumulate from daytime toward evening, which corresponding well with the lower temperature, the higher humidity and the absence of UV index [Figure 3]. Shinwari et al. revealed that the β-glucuronidase reporter gene driven by the DREB1 promoters was induced at transcriptional level by low temperature in transgenic Arabidopsis. While in Barley, the expression of low-temperature-induced Wcs and Wcor gene families were regulated by photoperiod and temperature through separate pathways. According to the report from Thioune et al. relative expression level analyses of genes involved with abscisic acid signaling, such as CcNCED3, indicated temperature-dependent, transcriptional change during the humidity shock treatments in coffee leaves. Although it had been demonstrated that the higher concentrations of cumulative patchoulol corresponded to lower light intensity in patchouli, there was no statistically significant correlation between patchoulol content and shading levels. While in most cases, nocturnal emission of volatiles is controlled directly by light. The results presented here suggest that more detailed studies on the combined effects of circadian clock and weather condition are warranted. However, the molecular mechanisms based on the circadian clock, as well as its interactions with environmental signal and plant physiology exhibit complex and incompletely understood networks. The promoter regions of some circadian-regulated genes in poplar leaves had been observed to have a relatively conserved motif within 300 bp of their start codons, which is associated with circadian regulation. Therefore, the availability of genome sequences of P. cablin has permitted a more systematic and comprehensive survey of clock-controlled PTS gene.,. In the present study, we have cloned a PTS gene that accounts for sesquiterpene especially patchoulol biosynthesis in P. cablin leaves. Moreover, the data reported here indicate that the expression of PTS in patchouli leaves varies throughout a day, with circadian regulation implicated. Clearly further study on clock-controlled architecture and function in P. cablin is needed. This work was financially funded by the National Natural Science Foundation of China (No. 81302745). Yang L, Yang C, Li C, Zhao Q, Liu L, Fang X, et al. Recent advances in biosynthesis of bioactive compounds in traditional Chinese medicinal plants. Sci Bull (Beijing) 2016;61:3-17. Mercke P, Bengtsson M, Bouwmeester HJ, Posthumus MA, Brodelius PE. Molecular cloning, expression, and characterization of amorpha-4,11-diene synthase, a key enzyme of artemisinin biosynthesis in Artemisia annua L. Arch Biochem Biophys 2000;381:173-80. Sharon-Asa L, Shalit M, Frydman A, Bar E, Holland D, Or E, et al. Citrus fruit flavor and aroma biosynthesis: Isolation, functional characterization, and developmental regulation of Cstps1, a key gene in the production of the sesquiterpene aroma compound valencene. Plant J 2003;36:664-74. Green SA, Chen X, Nieuwenhuizen NJ, Matich AJ, Wang MY, Bunn BJ, et al. Identification, functional characterization, and regulation of the enzyme responsible for floral (E)-nerolidol biosynthesis in kiwifruit (Actinidia chinensis). J Exp Bot 2012;63:1951-67. Ee SF, Mohamed-Hussein ZA, Othman R, Shaharuddin NA, Ismail I, Zainal Z, et al. Functional characterization of sesquiterpene synthase from Polygonum minus. ScientificWorldJournal 2014;2014:840592. Wang J, You S, Zhou LN. Progress in research of sesquiterpenoids biotransformation. J Shenyang Pharm Univ 2012;29:156-64. McClung CR. Beyond arabidopsis: The circadian clock in non-model plant species. Semin Cell Dev Biol 2013;24:430-6. Staiger D, Shin J, Johansson M, Davis SJ. The circadian clock goes genomic. Genome Biol 2013;14:208. Barinaga M. Clock photoreceptor shared by plants and animals. Science 1998;282:1628-30. Kaldis AD, Kousidis P, Kesanopoulos K, Prombona A. Light and circadian regulation in the expression of LHY and lhcb genes in Phaseolus vulgaris. Plant Mol Biol 2003;52:981-97. Miwa K, Serikawa M, Suzuki S, Kondo T, Oyama T. Conserved expression profiles of circadian clock-related genes in two Lemna species showing long-day and short-day photoperiodic flowering responses. Plant Cell Physiol 2006;47:601-12. Lou P, Wu J, Cheng F, Cressman LG, Wang X, McClung CR, et al. Preferential retention of circadian clock genes during diploidization following whole genome triplication in Brassica rapa. Plant Cell 2012;24:2415-26. Harmer SL, Hogenesch JB, Straume M, Chang HS, Han B, Zhu T, et al. Orchestrated transcription of key pathways in Arabidopsis by the circadian clock. Science 2000;290:2110-3. Wiberley AE, Donohue AR, Westphal MM, Sharkey TD. Regulation of isoprene emission from poplar leaves throughout a day. Plant Cell Environ 2009;32:939-47. Sun X, Wang XF, Zheng CS, Xing SY, Shu HR. The cDNA cloning and analysis of sequence information and quantitative express of Chrysanthemum rhythms clock output gene CmGI (GIGANTEA). Sci Sin B 2012;45:2690-703. Zhang Y, Zhang JC, Chen Y, Yang MS, Cao H, Xiao PG. Current progresses in pharmacognosy, chemistry, and pharmacology of Pogostemon cablin. Chin Tradit Herb Drugs 2006;37:786-90. Wu ML, Li XW, Huang SJ, Wu J, Chen SL. A suitability evaluation of the global producing area of Pogostemon cablin based on GMPGIS. World Sci Technol Mod Tradit Chin Med 2016;18:1251-7. Swamy MK, Sinniah UR. A comprehensive review on the phytochemical constituents and pharmacological activities of Pogostemon cablin benth. : An aromatic medicinal plant of industrial importance. Molecules 2015;20:8521-47. Deguerry F, Pastore L, Wu S, Clark A, Chappell J, Schalk M, et al. The diverse sesquiterpene profile of Patchouli, Pogostemon cablin, is correlated with a limited number of sesquiterpene synthases. Arch Biochem Biophys 2006;454:123-36. Yu ZX, Wang LJ, Zhao B, Shan CM, Zhang YH, Chen DF, et al. Progressive regulation of sesquiterpene biosynthesis in arabidopsis and Patchouli (Pogostemon cablin) by the miR156-targeted SPL transcription factors. Mol Plant 2015;8:98-110. Ueda HR. Systems biology flowering in the plant clock field. Mol Syst Biol 2006;2:60. Hendel-Rahmanim K, Masci T, Vainstein A, Weiss D. Diurnal regulation of scent emission in rose flowers. Planta 2007;226:1491-9. McClung CR. Plant biology: Defence at dawn. Nature 2011;470:44-5. Martin DM, Aubourg S, Schouwey MB, Daviet L, Schalk M, Toub O, et al. Functional annotation, genome organization and phylogeny of the grapevine (Vitis vinifera) terpene synthase gene family based on genome assembly, FLcDNA cloning, and enzyme assays. BMC Plant Biol 2010;10:226. Motamayor JC, Mockaitis K, Schmutz J, Haiminen N, Livingstone D 3rd, Cornejo O, et al. The genome sequence of the most widely cultivated cacao type and its use to identify candidate genes regulating pod color. Genome Biol 2013;14:r53. Meena S, Rajeev Kumar S, Dwivedi V, Kumar Singh A, Chanotiya CS, Akhtar MQ, et al. Transcriptomic insight into terpenoid and carbazole alkaloid biosynthesis, and functional characterization of two terpene synthases in curry tree (Murraya koenigii). Sci Rep 2017;7:44126. Hartwig S, Frister T, Alemdar S, Li Z, Krings U, Berger RG, et al. Expression, purification and activity assay of a patchoulol synthase cDNA variant fused to thioredoxin in Escherichia coli. Protein Expr Purif 2014;97:61-71. Attia M, Kim SU, Ro DK. Molecular cloning and characterization of (+)-epi-α-bisabolol synthase, catalyzing the first step in the biosynthesis of the natural sweetener, hernandulcin, in lippia dulcis. Arch Biochem Biophys 2012;527:37-44. Wu YG, Guo QS, Zheng HQ. Textual research on history of introduction [corrected] and herbal medicine of Pogostemon cablin. Zhongguo Zhong Yao Za Zhi 2007;32:2114-7, 2181. Sandes SS, Zucchi MI, Pinheiro JB, Bajay MM, Batista CE, Brito FA, et al. Molecular characterization of Patchouli (Pogostemon spp) germplasm. Genet Mol Res 2016;15:1-12. Liu L, Wu YG, Yu J, Zhang JF, Yang DM, Chen P. Expression analysis of PTS gene of Pogostemon cablin at different time points. J Trop Biol 2016;7:89-91. Dudareva N, Martin D, Kish CM, Kolosova N, Gorenstein N, Fäldt J, et al. (E)-beta-ocimene and myrcene synthase genes of floral scent biosynthesis in snapdragon: Function and expression of three terpene synthase genes of a new terpene synthase subfamily. Plant Cell 2003;15:1227-41. Shinwari ZK, Nakashima K, Miura S, Kasuga M, Seki M, Yamaguchi-Shinozaki K, et al. An arabidopsis gene family encoding DRE/CRT binding proteins involved in low-temperature-responsive gene expression. Biochem Biophys Res Commun 1998;250:161-70. Fowler DB, Breton G, Limin AE, Mahfoozi S, Sarhan F. Photoperiod and temperature interactions regulate low-temperature-induced gene expression in barley. Plant Physiol 2001;127:1676-81. Thioune EH, McCarthy J, Gallagher T, Osborne B. A humidity shock leads to rapid, temperature dependent changes in coffee leaf physiology and gene expression. Tree Physiol 2017;37:367-79. Ji SG, Cai JL, Lu HJ, Zheng ZT. Effect of different light intensity on Patchouli alcohol content of Pogostemonis cablin. Hubei Agric Sci 2016;55:406-9. Jakobsen HB, Olsen CE. Influence of climatic factors on emission of flower volatiles in situ. Planta 1994;192:365-71. Hsu PY, Harmer SL. Wheels within wheels: The plant circadian system. Trends Plant Sci 2014;19:240-9. He Y, Xiao H, Deng C, Xiong L, Yang J, Peng C, et al. The complete chloroplast genome sequences of the medicinal plant Pogostemon cablin. Int J Mol Sci 2016;17:1-11. He Y, Xiao H, Deng C, Xiong L, Nie H, Peng C, et al. Survey of the genome of pogostemon cablin provides insights into its evolutionary history and sesquiterpenoid biosynthesis. Sci Rep 2016;6:26405.